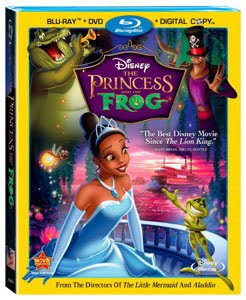 We watched The Princess and the Frog movie when it first arrived in theaters last year. My daughter will always have fond memories of Princess Tiana and the other characters because it was the first movie she saw in a movie theater. Even though the darkness of the movie and the voodoo aspects surprised me, I appreciated the hand drawn animation and diverse musical score in the New Orleans style. Today the movie makes its debut on Blu-ray™ Combo Pack and DVD. Since we weren't one of the lucky blogs selected to review the new DVD, we'll most likely buy our own copy to add to our Disney Princess collection. If you are planning to purchase your own Blu-ray™ Combo Pack, don't forget to print out the $10 coupon available at http://disney.go.com/disneyvideos/disneymagicalsavings/. Plus, check out Friday's Full to the Brim list and enter some of the blog contests for the DVD. I took my daughter to see that movie in the theater too. I love Disney movies and was so happy when I found out that they made another princess one.